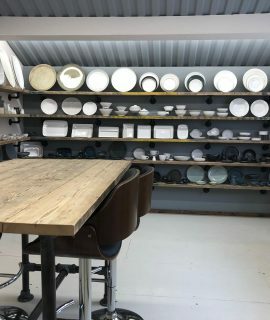 At Surrey Ceramics, you have full control over your ceramic tableware; right down to the type of glaze and finish used. 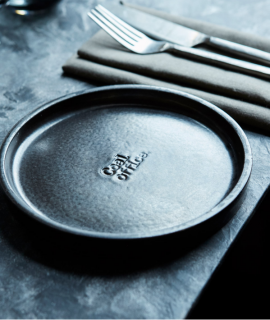 We have over 30 ceramic finishes to choose from, so we’re sure to have the perfect glaze to compliment your dish, restaurant and brand style. Browse our full range of ceramic finishes below. If you can’t find what you are looking for, just get in touch and we’ll be happy to assist. 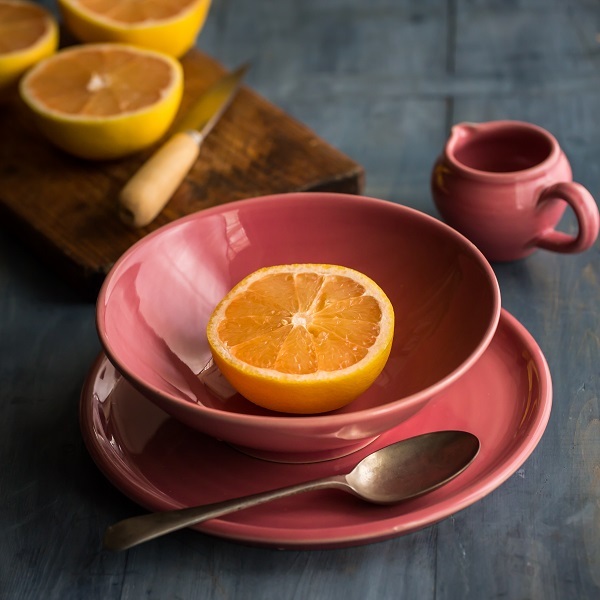 Bright and uplifting this strong, pink glaze grabs attention. Use all over on small items for a pop of vibrant colour or use to accentuate the edges of studio white pieces for an eye-catching contrast. The combination of a lighter glaze over-sprayed with another result in the gentle fusion of the two in the firing process, as they blend into each other. 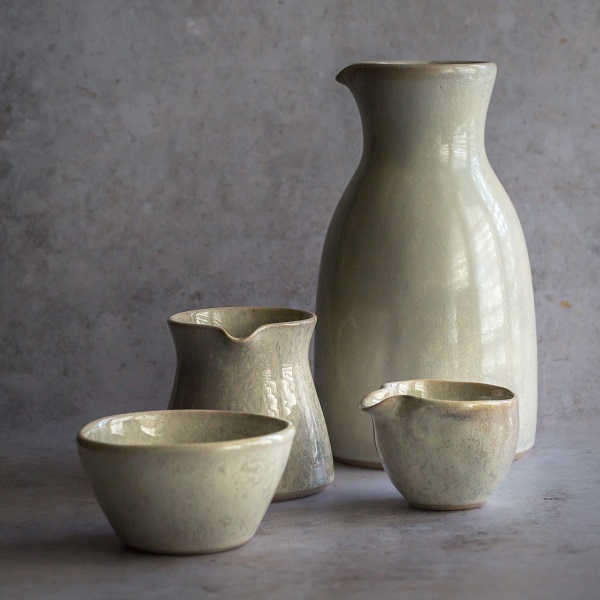 This is a reactive glaze in its truest form, each piece exquisitely distinct. Often used to describe a summer sky, Azure is a delicate blue glaze finish featuring a subtle reaction. An iron oxide band frames each piece, the dark colour creating a striking contrast, however can be ordered without for a more understated finish. 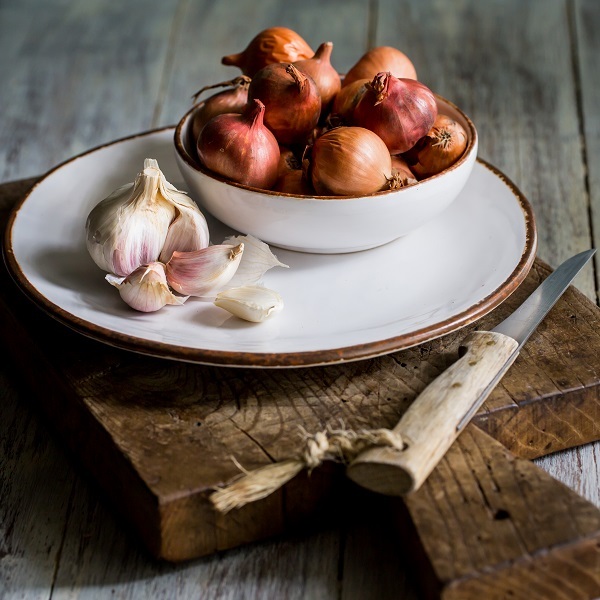 Barley is one of a few matt glazes, which are becoming increasingly popular. 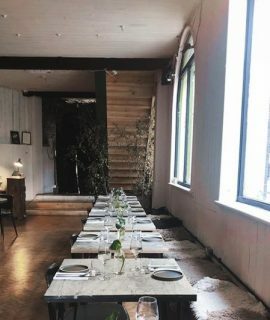 Very natural in its finish, it has an earthy tone and texture that captures the warm spirit of outdoor dining, yet can be used in the most sophisticated of environments. A soft, satin black with gentle hues of brown/bronze breaking through this semi-reactive glaze. A softer alternative to plain black makes it an ideal presentation platform for vibrant, colourful food displays. 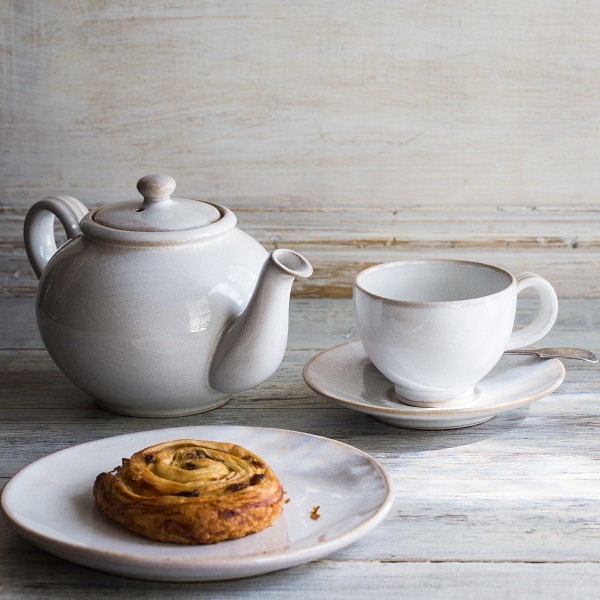 This striking finish can be further enhanced by leaving the edge or base of the item unglazed. The light, natural clay body stands out against the dark finish to create a dramatic contrast. 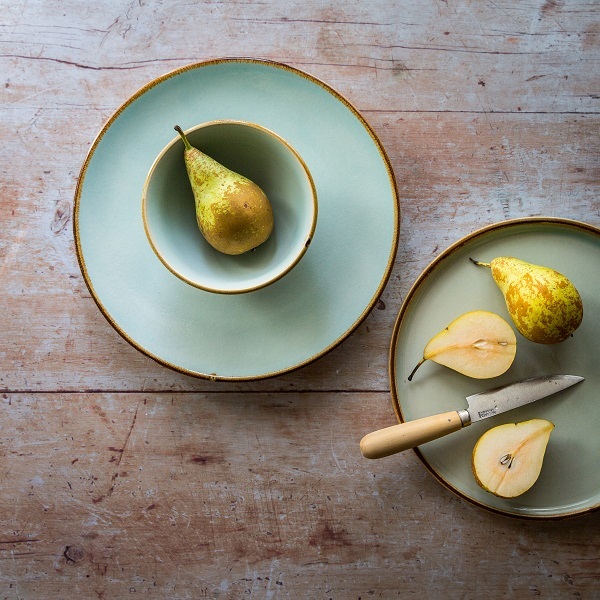 Another of our matte glaze finishes, Denim has become one of the most popular glaze colours in our collection. Each piece unique from the last, thanks to the darkening of the colour around the edges of items, adding depth to this light blue colour. 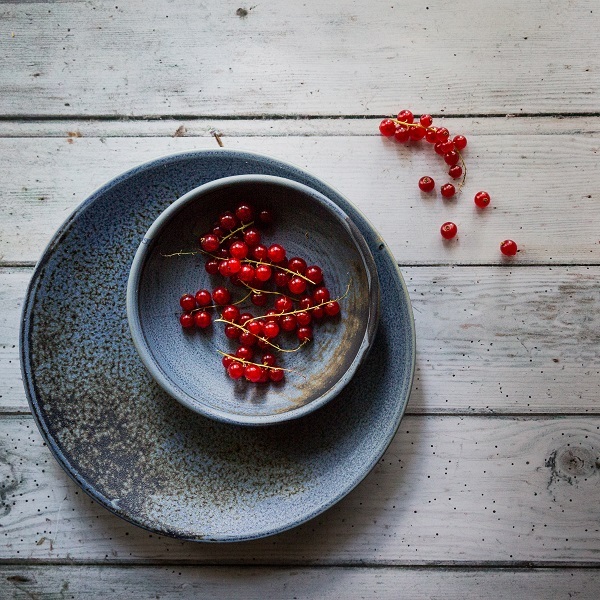 The slightly rougher texture than a traditional gloss glaze makes Denim an interesting and inspiring choice for any tableware. 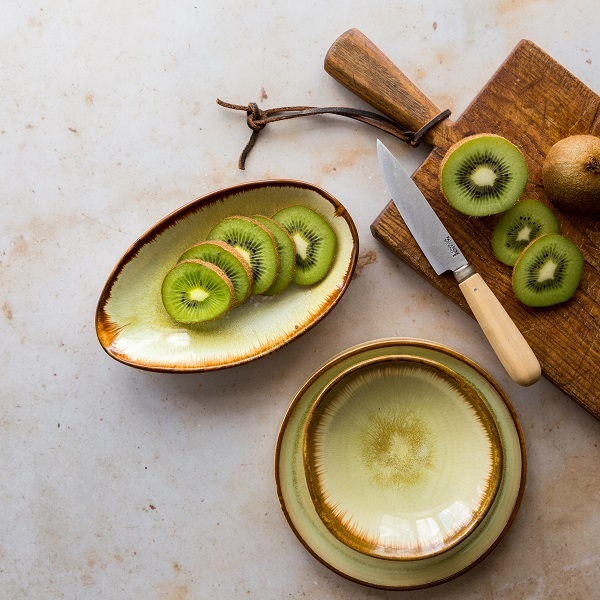 A fresh, rich green, with a faint white sprayed by hand over the top causing a gentle reaction; this spectacular glaze is further enhanced with a brown edge, which naturally bleeds into the glaze during the firing process, giving a unique character to each piece. The satin/matt finish is very much on trend and offers a distinctive, colour palate to inspire creativity. Another one of our heavy reduction glazes, Forget Me Not Blue is an exquisite glaze that really stands out. 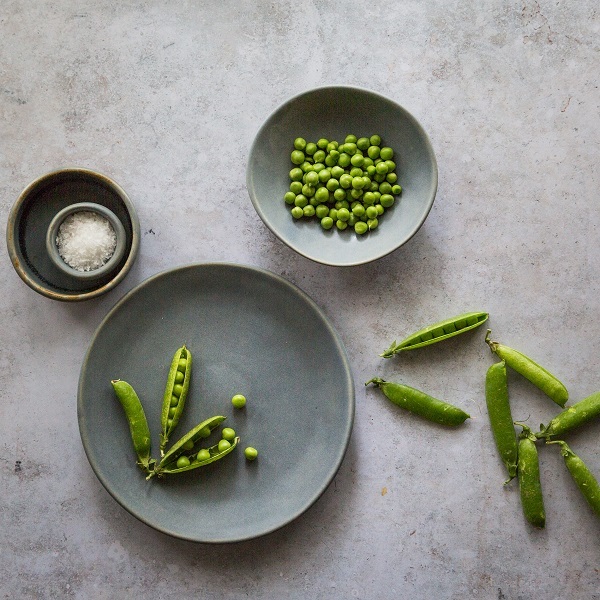 Captivating the eye with its intensity and gentle reaction, it can be used to make a bold statement or to inject a little bit of stylish colour into a tableware collection. 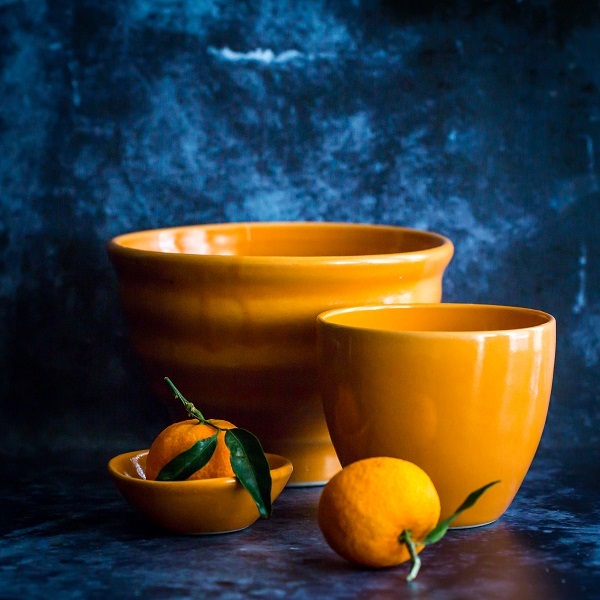 Set any table alight with this warm yellow glaze. 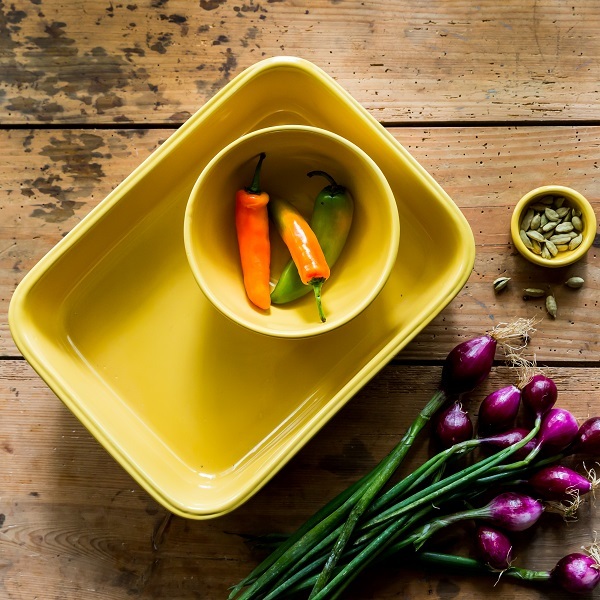 Bring the radiance of the sun to any dish and create enviable colour combinations by mixing and matching with our other bright colour finishes. A satin finish with tones of blue and grey and breaks of brown on the edges of some items. 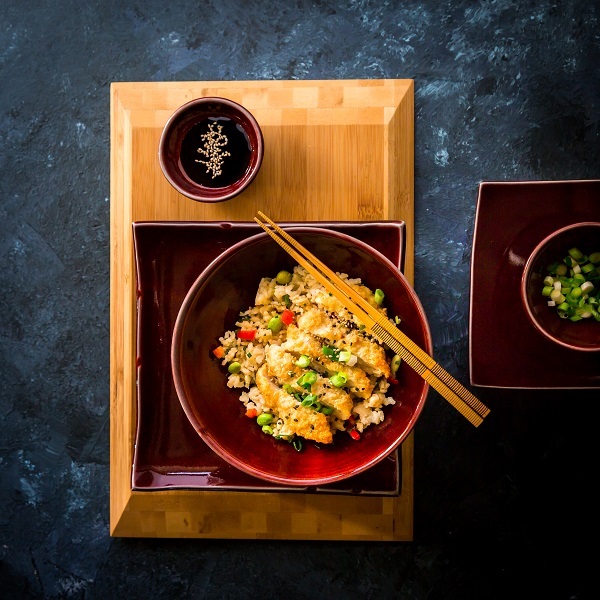 An attractive glaze finish that acts as a neutral base for luxury food presentation. This finish can be further enhanced by requesting pieces with an unglazed edge to make the colour really pop. 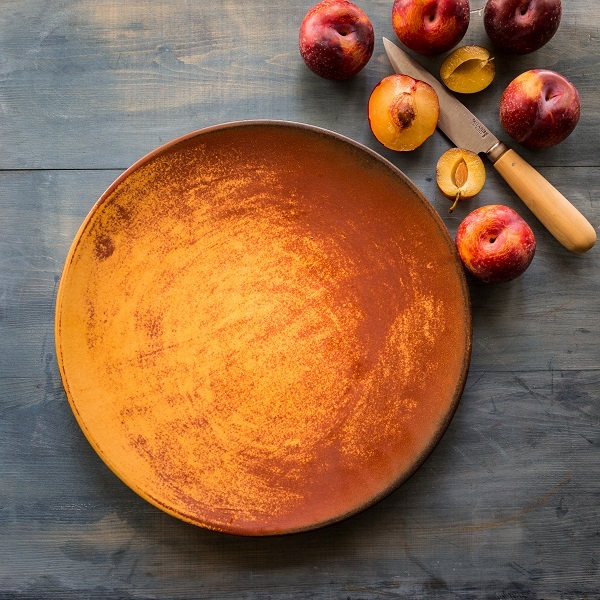 Reminiscent of the green pigment formed on weathered bronze, this intense, deep glaze finish is enhanced by shades of coppery gold reacting across the surface. 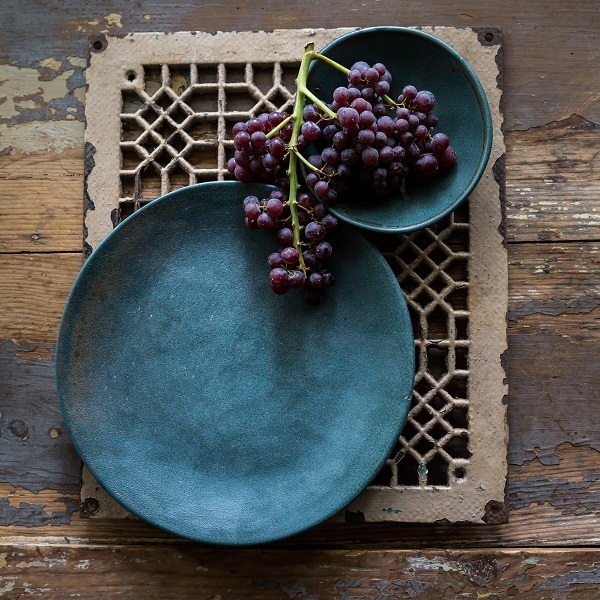 Green Verdigris has a textured, matt finish adding even more interest to an already captivating glaze. Creamy white with reactions of light grey extending across the surface and around the edge. 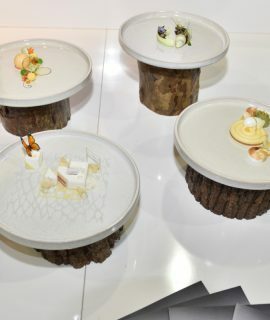 Each piece is truly unique, creating a stunning table display. A fantastic option for chefs, wanting a light base to showcase their food, with an understated touch of elegance and complexity. 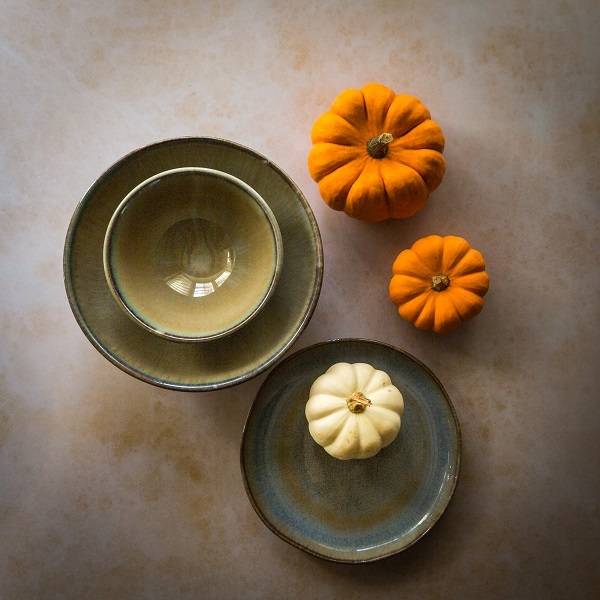 The friendly, warm and uncomplicated lines of Harvest evoke the rustic charm of a traditional craft glaze finish. Encapsulating the essence of home style comfort perfectly, with an authentic, hand- crafted look. A dark glaze with flecks of reactive gold and bronze. Each piece develops its own distinctive character as it goes through the firing process. 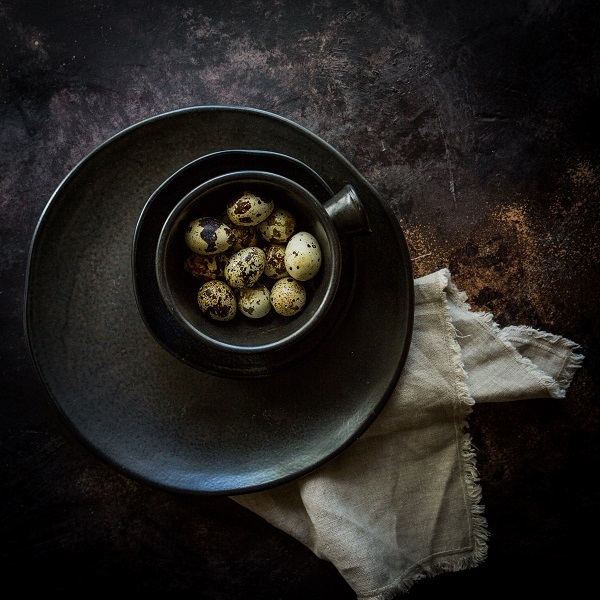 The darkness of the glaze gives a contemporary feel and is the ideal platform for light and colourful ingredients. 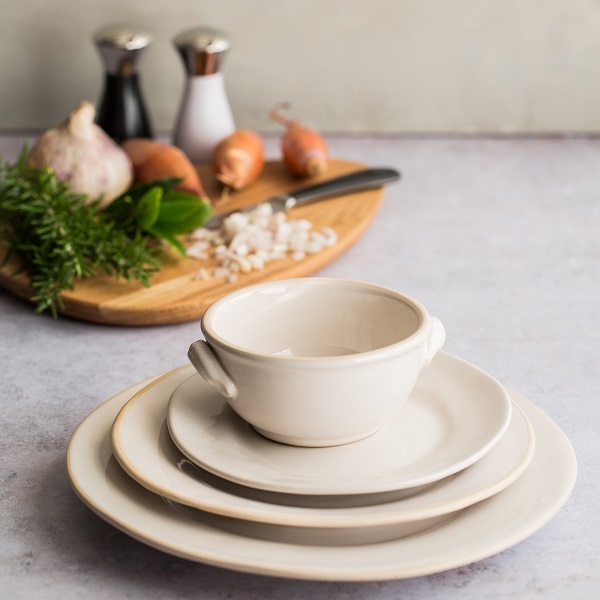 A subtle, off-white glaze finish, JO White is a multipurpose glaze which can be used for carefree and sophisticated dining settings equally. A perfect alternative to the traditional bright white of formal dining, without leaving behind any of the elegance. 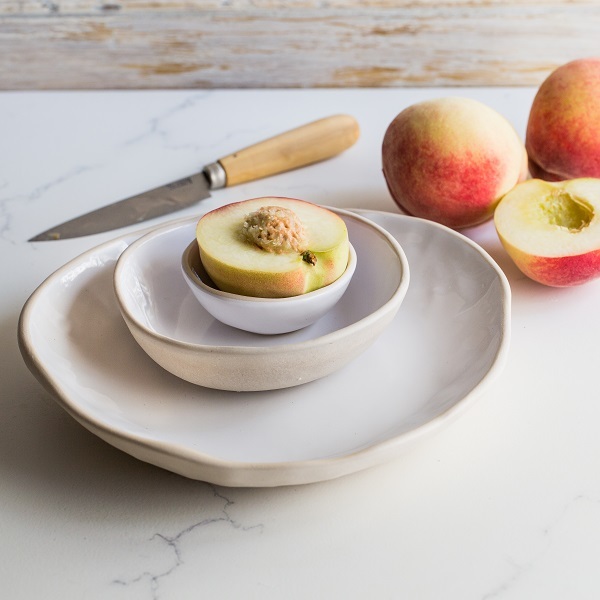 Take inspiration from Soho and choose an unglazed edge on items to really stand out. Fresh and invigorating, Lime Green really stands out when paired with studio white. 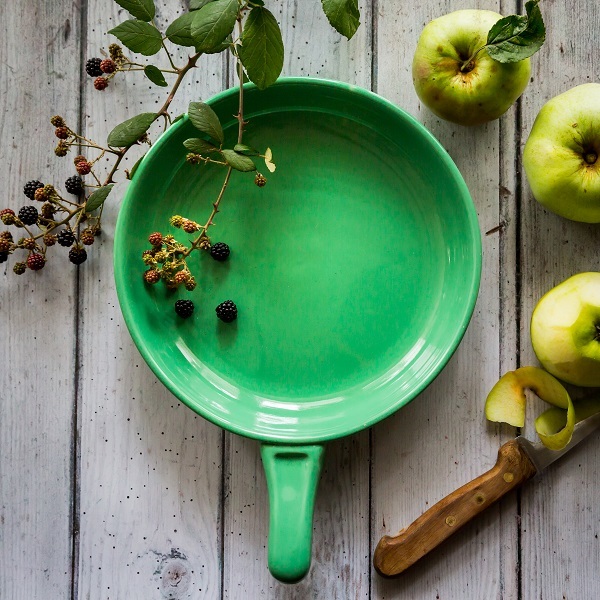 This colourful green also looks fantastic when the edge or base of an item is left unglazed, allowing the natural clay body to show and the lively colour catch the eye. 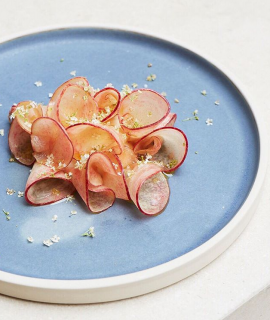 Murano is a great alternative to the typical white plates usually available. A contemporary, almost translucent white glaze, the delicate reaction to its surface gives a very subtle texture. 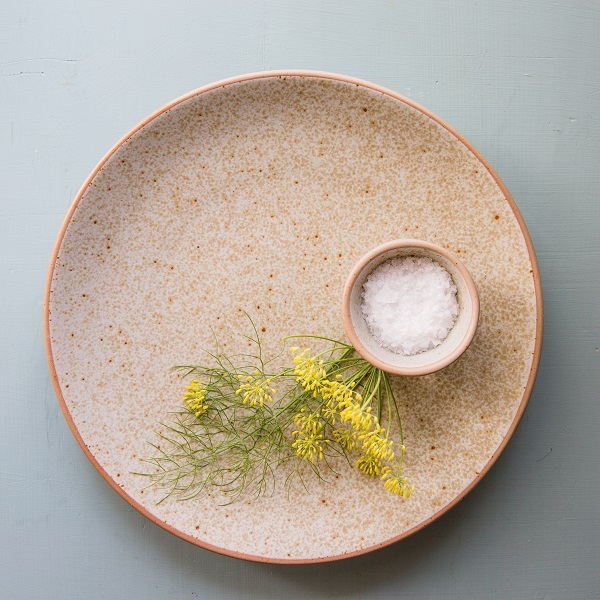 This glaze naturally thins out on the edges of certain items, pairing well with the dazzling pearlescent shine. 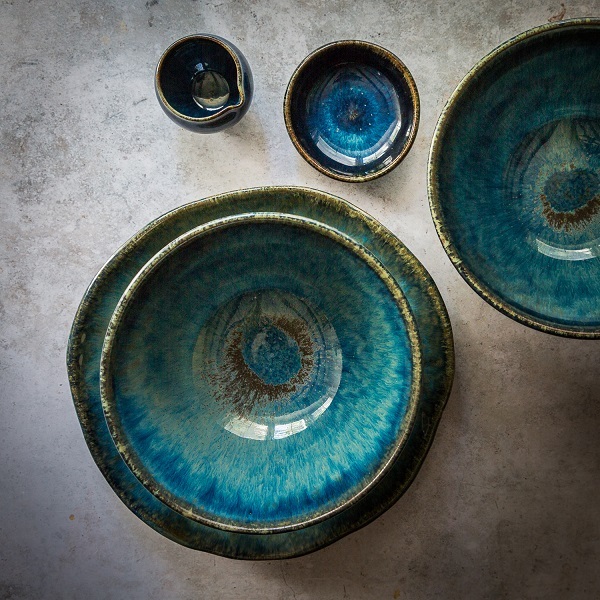 A spectacular glaze finish, highlighting the colours of food and captivating the eye with tones of blue. 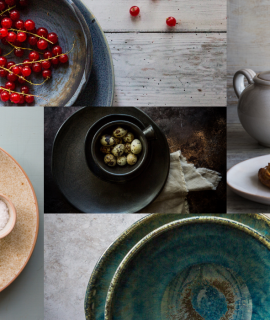 The mixture of two glazes changing and moving during the firing process creates an artistic quality on each piece of tableware. Reacting differently depending on what item it is fired on, creating an interesting dynamic between pieces. A delicate green glaze, framed by a dark, reactive edge that bleeds and blends into the glaze as it is fired, creating attractive feature pieces that stand alone or combine superbly with plain glazed items. Subtle and striking at the same time. 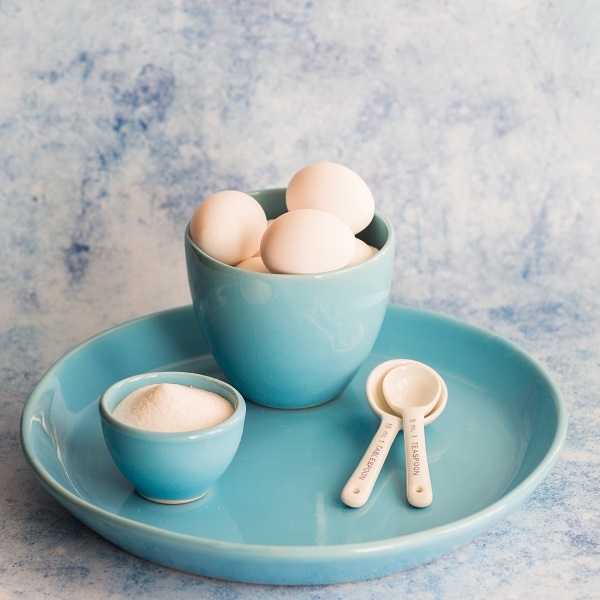 Taking the name from the distinctive blue eggs laid by the American Robin, this vivid blue is ideal for adding a pop of colour to any tableware display. 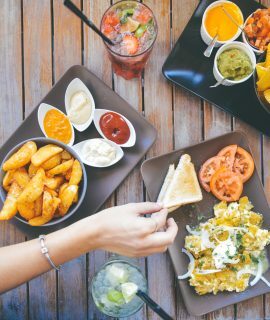 Sitting happily alongside white and other bright colours you can create truly unique food presentations. An intense red, achieved using our unique heavy reduction firing technique. 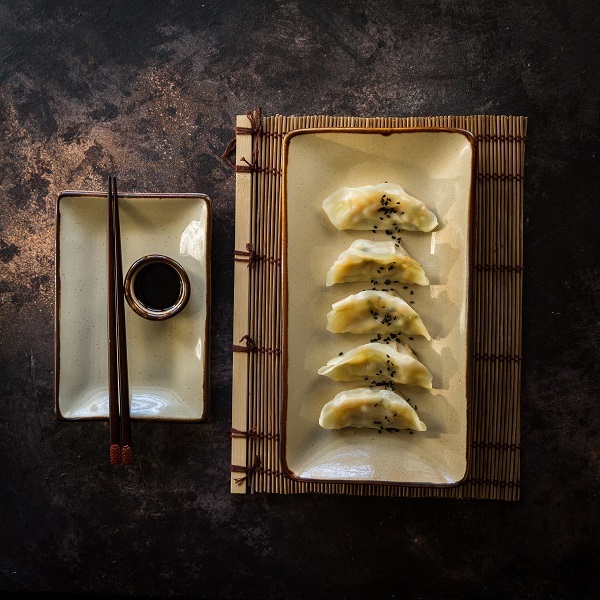 This sophisticated glaze stands out without over-shadowing food presentations. A striking colour on its own, this rich red pairs well with darker colours, such as Jasper and Delhi Black. Overflowing with authentic continental appeal, Sienna evokes the mood and senses of al fresco dining at its best. 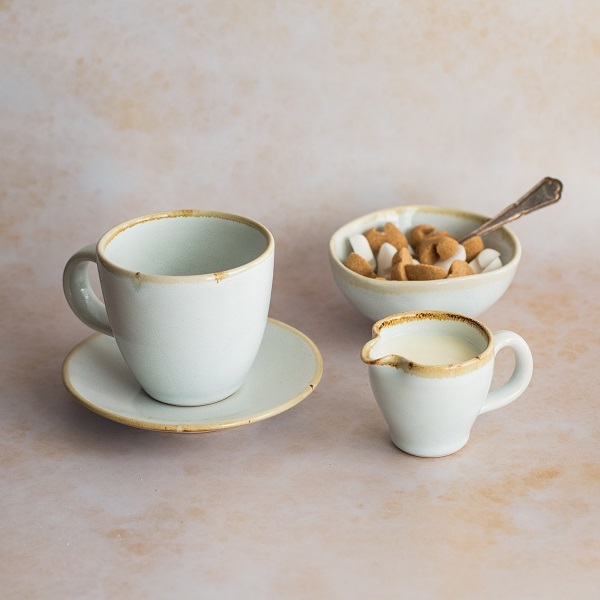 The natural tones of the subtly reactive, textured glaze give each piece a slightly individual feel while retaining the overall look. 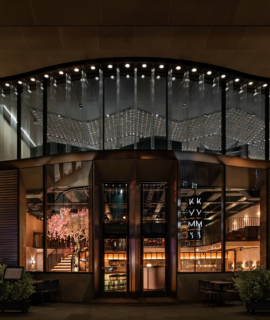 In a class of its own, the sophistication and refreshingly individual lines of Soho successfully bring contemporary chic to an exclusive dining experience. The combination of organic shapes and white glaze is beautifully balanced by the natural clay on the edge of each piece. 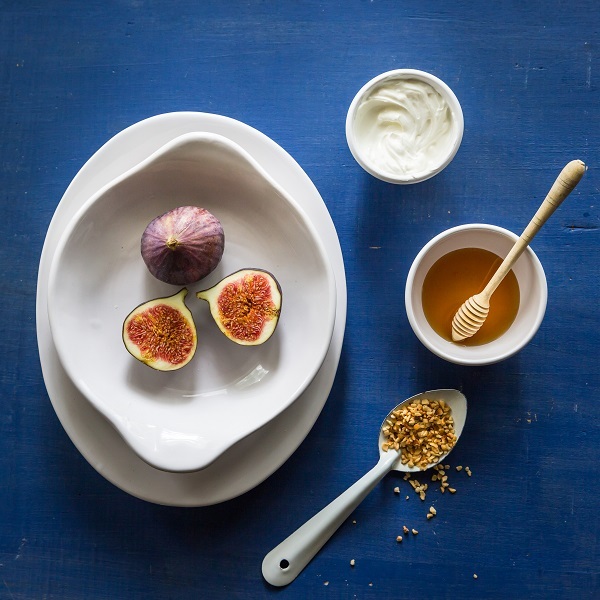 A brilliant white glaze finish to enhance the presentation of food, a great base colour to compliment other glaze finishes to achieve a unique style. 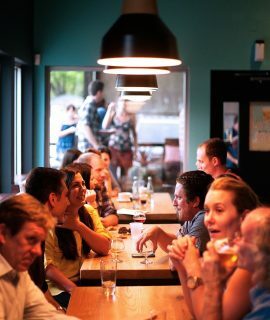 An excellent choice for laid back and fine dining alike. This finish is the combination of the clean lines of Studio White with additional detailing of Sienna applied to the edge of each piece which brings a soft tone to the brilliant white. 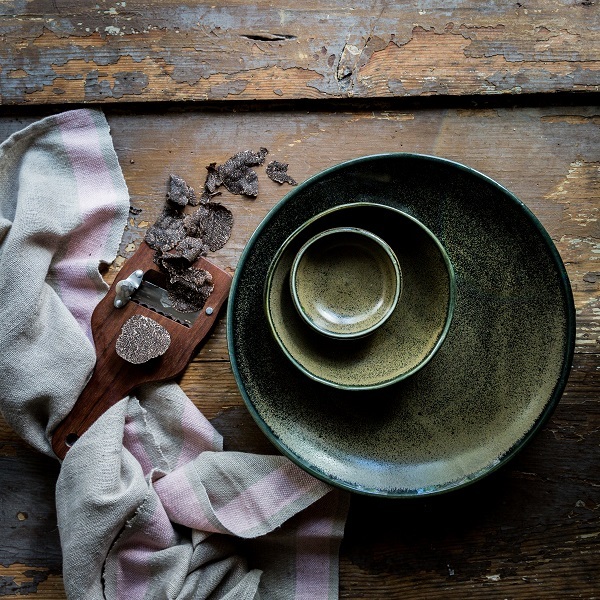 Sienna, being a subtly reactive glaze, makes the edging line break and gives added charm to the finished piece. 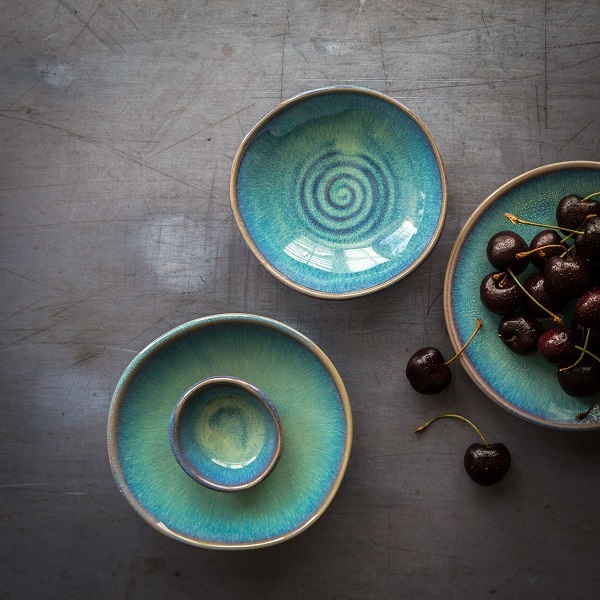 Fired using a unique heavy reduction method, the atmosphere in the kiln transforms the glaze, to produce a mixed matt/satin finish, during the course of firing. 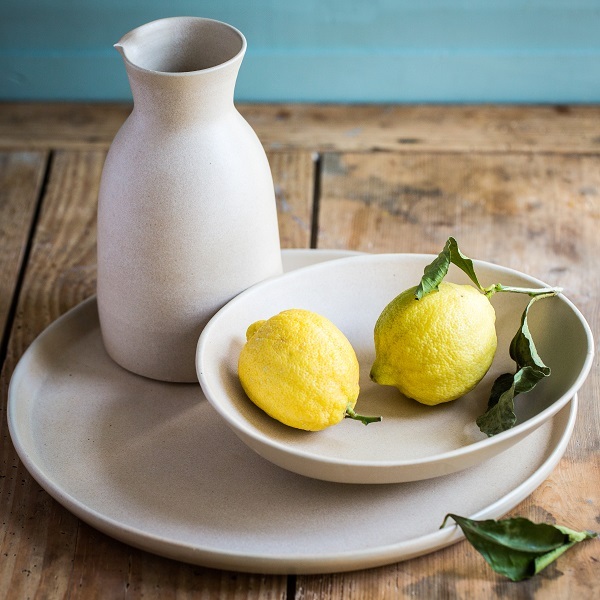 Further enhanced by the bare clay on the edge which darkens during the firing process, this compliments the glaze and overall presentation, particularly on irregular shapes. As the name suggest Vibrant Orange is an explosion of bright, vivid orange. This flamboyant glaze is just one of a number of bright colours we produce that catch the eye and particularly comes into its own when paired with white. Perfect on its own or used alongside other bright colours.